What to Wear to a Wedding Is the only difference between a white tie wedding and a black tie wedding the color of the tie? How casual are you allowed to dress if the invitation says semi-casual? Does beach formal mean your swimsuit and flip flops are the right look? 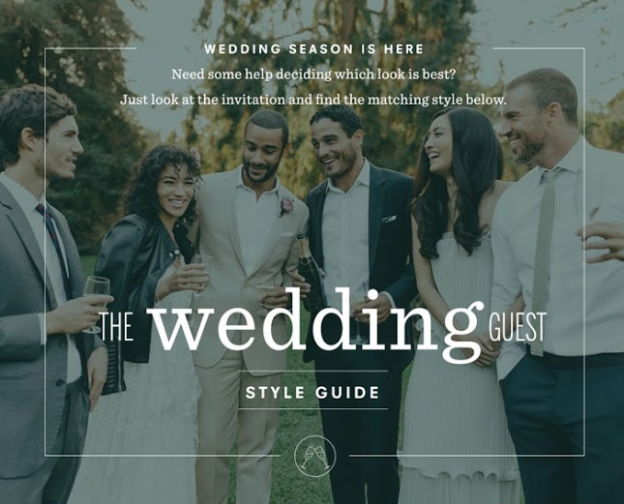 Navigating the dress code for a wedding can be difficult, and just when you think you have found the perfect outfit for the occasion, you second-guess yourself. From a sandy beach wedding to an elegant ballroom wedding, here are a few tips and tricks to help you pick out the perfect attire for any wedding! Casual For Him: Gentlemen, when it comes to dressing casual, a nice polo or button down shirt will do. Don’t stress about pairing a tie, but make sure you wear pants that are ironed out and are well-fitting. For Her: We love how much fun you can have with your attire when it comes to dressing casual! Don’t be afraid to go natural with your makeup and wear a simple or patterned sundress you’ve been dying to show off! Some of our favorite sundresses are from Nordstrom. Semi-Formal – Dressy Casual For Him: Now I know you might be thinking, it’s semi formal so that means a polo will fit the dress code! Wrong. Put that polo back in the closet. Instead, opt for a solid, seasonal-colored button-down, with a tie that matches the outfit of your date. Don’t be afraid of playful patterns, though! Here’s a Reddit thread with some great recommendations. For Her: For a semi-formal look, think of your outfit as if you were going to a cocktail hour! A well-fitting dress or a dressy top with a skirt will be the perfect look for this occasion. 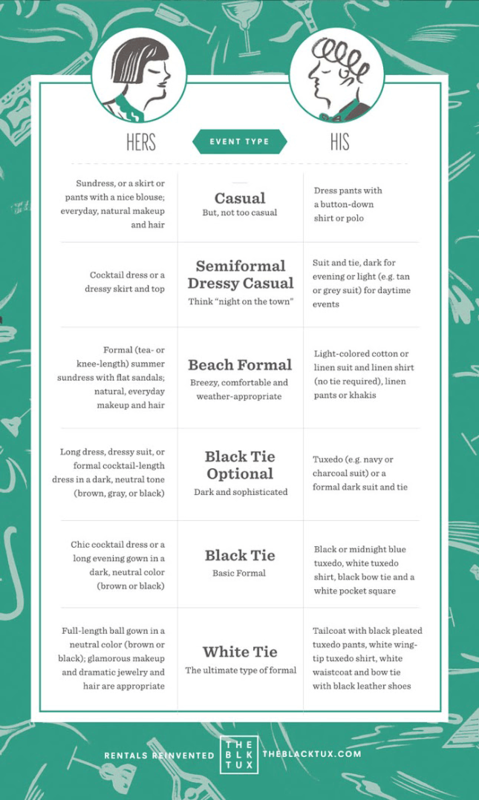 Beach Formal For Him: Don’t be too quick to grab your suit and flip flops, guys! What this dress code implies is to dress smart for the elements of sand, sun and water. I know, what’s more perfect for the occasion than a bathing suit? Go for a light linen shirt or a breezy suit of a more summery color, like tan. Sandals can be appropriate if they look more formal (and no, flip flops do not count as sandals). For Her: A sundress will do just the trick for this wedding theme! Find a patterned dress and pair it with white sandals or a fun, oversized hat! Don’t be afraid to bring along your favorite pair of dramatic or simple sunglasses! Black Tie Optional For Him: This is the perfect time to break out that tuxedo if you have one. Iff not, renting is all the rage now, so consider looking at The Black Tux’s tuxedo and suit rentals! To be on the safe side, choose a suit that is a darker color, like navy or midnight blue. For Her: When it comes to a black tie optional theme, think of wearing a dress that is longer, but not quite floor length. Just like the men’s attire for this theme, pick a dress in a color that is darker and more sleek. Or, as the Refinery trend-casted for this year, go ahead and don a suit yourself! Black Tie For Him: A classic tux is the name of the Black Tie game. Prepare to feel like James Bond as you look your best in a well-fitting tuxedo! If you’re feeling stuffy in it, go ahead and pair it with some playful socks, like these from Happy Socks. They’re the perfect subtle-ly fun accessory. For Her: When it comes to a black tie dress code for ladies, we encourage floor-length gowns with simple jewelry to accompany it. Less is more when it comes to this dress code. Top off the elegance with a slicked-back bun or ponytail. White Tie For Him: There are no cutting corners when it comes to a white tie event, gentlemen. Tailcoats, pleated tuxedo pants and a waistcoat are a few of the essential ingredients to this look. This is the ultimate type of formal and prepare to dress to impress. For Her: This is the evening to finally wear that beautiful ball gown you have been saving for an occasion such as this! Dramatic jewelry and makeup are the perfect combination and are sure to make you feel just as glamorous as the evening itself!